Click on the postcard below to check out tips and tricks from Green Month, 2012. Here are some more tips to keep you green every time you take your vehicle out on the road. A smooth, steady speed saves gasoline and reduces wear and tear on the engine, tires, transmission and brakes. Aggressive driving and quick starts increase fuel consumption by as much as 39%. You only save 2.5 minutes for every hour spent on the road when you drive aggressively. Fuel economy decreases about 1% for each kilometer-per-hour over 80. Driving 90 km/h vs 100 km/h for example, increase fuel economy by about 10%. Overdrive gears slow engine speeds which saves gasoline and reduces wear. By helping to maintain a constant speed, cruise control reduces gasoline consumption. Use both features only when safe and appropriate. A single tire under-inflated by just 8 psi (56 kPa) can lose 15,000 ms from its lifespan and increase fuel consumption by 4%. Measure your tripe pressure at least once per month to ensure they are properly inflated. Remove roof racks and other heavy items from your vehicle when you’re not using them. An extra 100 lbs an decrease fuel economy by 1-2%. Replacing a clogged air filter can increase fuel efficiency by 10%. A misfiring spark plug can reduce fuel efficiency by as much as 30%. Using the manufacturer’s recommended grade of motor oil can improve your gas mileage by 1-2%. A well-maintained vehicle saves you money, reduces harmful emissions and makes the roads safer for everyone. Choose products, services and packages that are environmentally-sensitive to reduce your carbon footprint with every visit to the shop. 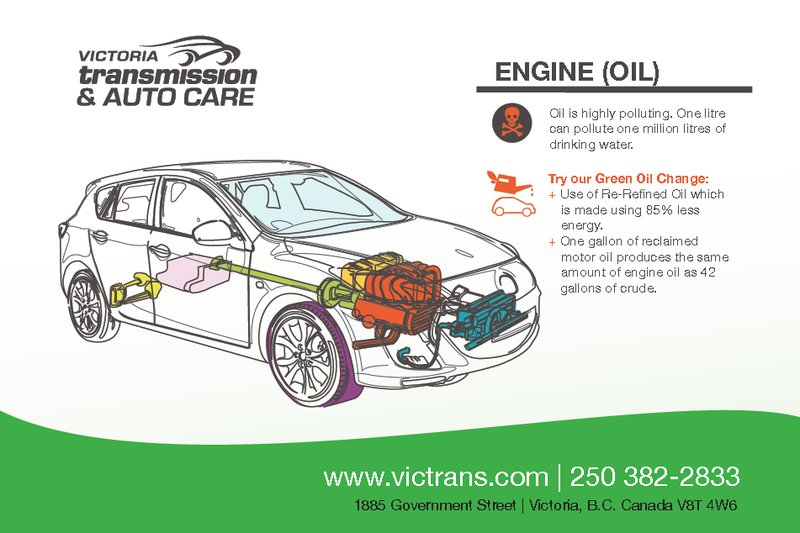 Victoria Transmission and Auto Care is proud to offer products such as re-refined oil, recycled windshield fluid, bio-based grease, and eco-friendly anti-freeze as part of our many ‘Green’ packages.